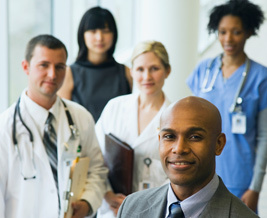 FMDA was formed in 1990, to help medical directors, attending physicians and other providers, practicing in post acute care, navigate their way through the continuum of care spectrum. FMDA is the official state affiliate of the AMDA - The Society for Post-Acute & Long Term Care Medicine and members include physicians, physician assistants, nurse practitioners, and pharmacists. It is also a specialty society of the Florida Medical Association. Please download and read these articles in advance by clicking on the title of each article. Dr. Rick Foley appointed to represent pharmacists on the board of directors. Click here to read the press release. 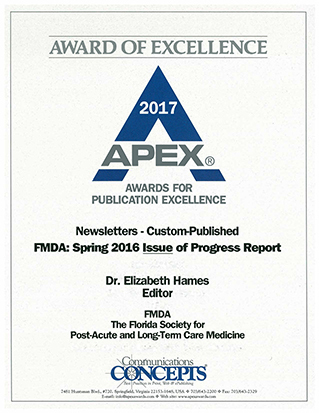 Progress Report Wins APEX 2017 Award of Excellence! Click here to read Press Release and see the award. FMDA President Testifies Before the House Health Innovation Subcommittee in Support of HB539. Click here to read Press Release.. If you are interesting in joining a committee, for a 1-year term, click here to complete this form.